Playazon is pleased to offer the 2005 Black Rock Art-Casting Audio Tour. 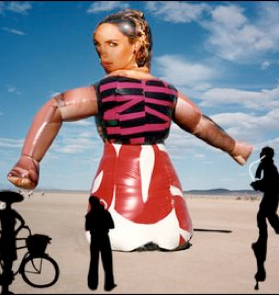 Since Burning Man itself wouldn't exist if not for the art, it is every citizen's duty to either make art, bring art or understand the art that others provide. The Black Rock Art-Casting Service is one of the quickest ways to bone up on playa art and to help you pass the 2005 art exit exam required to get out the gate on Monday. • What is this supposed to mean? • Did my ticket money help pay for it? • What does Chicken John think? • When is it going to burn? Please Note: To insure that the Art-Casting Service is as complete and up-to-date as possible, downloads will not be available on-line till August 10. * Last year's Audio Art Tour was a huge success, except with our accountant and the company that we rented the audio-tour equipment from. We ended up having to replace or repair over half the players due to exposure to playa dust. This year we decided to forgo hardware rentals, focus on content, and never take our iPods out of their plastic bags.